Western Hymn stretched his 100 per cent record to three as he successfully stepped up to Group Three company in the bet365 Classic Trial at Sandown. Sent off the 1-2 favourite after an impressive victory at Newbury on his seasonal bow, John Gosden's colt was held up in the early stages as Red Galileo and Automated made the running on the rain-softened ground. William Buick brought the son of High Chaparral with a sweeping run on the outside to head 25-1 outsider Impulsive Moment and win by a length and three-quarters, with Master Carpenter finishing third. Buick said: "It was by far the hardest task he's ever encountered. We just looked at it as a race for him to gain more experience. He handled the ground as good as any, but it wasn't ideal for any of the horses. "I thought it was a good performance. He got the job done and he did it quite well. He's got such a good turn of foot, like you saw when he won his maiden at Kempton and again when he won at Newbury. That ground slowed him down a bit. "There's no doubt he's an exciting horse. He hasn't done anything wrong so far. We'll see what the boss (John Gosden) decides to do now. It's exciting times." Gosden added: "He's got a good turn of foot this horse and on this ground it's hard for anything to show a turn of foot. "I think in the end William has hit the front a little sooner than he should have done, but the horse was going well. When he hit the front he started looking round and he was staring at the grandstand. "It turned into a touch of a slog because of the ground and because he got there too soon, but, at the same time, I liked the way he saw out the trip. This was a bit of a test for him, a mile and a quarter going up the hill at Sandown. 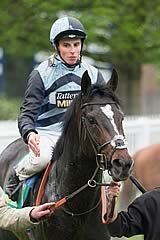 "Last year he won the only race of his life at Kempton. Then he went to the graduation race at Newbury, which was nice, and then it's only two weeks later to here. "I've always wanted to take him to the Dante Stakes, so we plan to do that. I hope it's good ground. These races come quick on horses, but he's had two weeks between this and now it's three weeks to the next, so that's enough spacing. Hopefully we can make it to the Dante and from there we will know the time of day."